Once you get over the disappointment that Jordan Peele’s second feature, Us, isn’t as trim or impish in its satire as his marvelous debut, Get Out, you can settle back and salute what it is: the most inspiring kind of miss. It’s what you want an artist of Peele’s sensibility and stature to attempt — to broaden his canvas, deepen his psychological insight, and add new cinematic tools to his kit. However clunky and repetitive, Us continues to demonstrate Peele’s understanding that great horror requires metaphors that are insanely great, that might have come to him in dreams of falling into a “sunken place” or, in this film, into a parallel subterranean world denuded of all material pleasures. Imagine Alice’s White Rabbit down and out and eaten away by deprivation. Imagine that it’s a white lab rabbit. Imagine a fusion of Lewis Carroll, George Orwell, and James Baldwin — plus arterial spray. So much here to love. Peele’s opening is up there with the nightmare classics. After titles that assert there are thousands of miles of tunnels under the U.S., many of which “have no known purpose at all,” we’re in a beachside Santa Cruz amusement park in 1986, where a little girl wanders away while her father is distracted by a game of Whac-a-Mole. (What better metaphor for macho futility?) Gothic convention compels the girl to enter a fun house on the beach with a sign reading vision quest: find yourself. In the hall of mirrors, she nervously whistles “Itsy Bitsy Spider” — and then hears someone whistling it back. What appears to be her mirror image is actually … well, that’s the question. The credit sequence that follows is diabolically brilliant: The camera rests on a white rabbit, then slowly pulls back to reveal a cage and then a vast wall of cages, each with its own leporine specimen. Michael Abels’s blend of The Omen–like Latin chants and polyphonic Afro-rhythms is so infectious you don’t even realize that by tapping your feet you’re helping to conjure the devil. It possesses you, this music. The first scenes lose the pulse, though, and the film never really recovers. In the present, the reasonably prosperous Wilson family goes to Santa Cruz for a vacation, its arrival broken by flashbacks to ’86 and the aftermath of the little girl’s trip to the fun house, when she’s mute, apparently in shock. The connection is Adelaide Wilson, who was once that little girl and is now a jittery mom played by Lupita Nyong’o. Adelaide is nervous about going back to the beach, which is easy to understand — but then why is she there in the first place? Peele’s writing is blah and perfunctory, especially when Adelaide’s husband, Gabe (Winston Duke), shows up with a powerboat he bought in a vain attempt to keep up with the Tylers (Elisabeth Moss and Tim Heidecker) and their much fancier house and athletic blonde daughters. 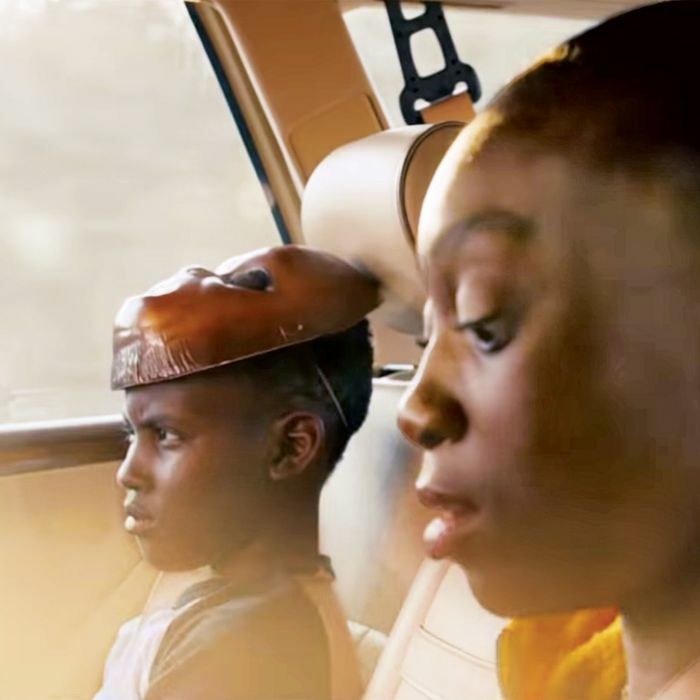 The Wilson kids, Zora (Shahadi Wright Joseph) and Jason (Evan Alex), are more cerebral, but we don’t get to know them before the so-called “us” arrive. This is the sort of movie that fans will rewatch to appreciate the fillips, the purposeful echoes, the bits of foreshadowing, and the performances. Moss has little screen time, but she shows her genius as her character’s murderous double. Watch her savor the act of putting on lip gloss: Her eyes turn dreamy, and her smile spreads so wide it looks as if it will swallow her face. This is zombie Kabuki. Nyong’o hits extraordinary notes. When she’s the double, her voice is the whistle of someone whose throat has been cut, with a gap between the start of a word in the diaphragm and its finish in the head. It’s like a rush of acrid air from a tomb, further chilled by eyes like boiled eggs, fixed on nothing in this world. The terrestrial Adelaide is more subtly scary; Nyong’o builds extra beats into the performance, lurches and ellipses that keep you from identifying with her too closely. Something’s off — but what? When the movie ends, you can rearrange the pieces in your head and appreciate the breadth of what Peele set out to achieve. Social scientists and pundits speak of human society in terms of gaps — in wages, in education, in quality of life. It’s Peele’s ingenious notion that the under- and over classes are not estranged but “tethered” in ways that those at the bottom perceive as mockery and theft but that the privileged can’t see — and can perhaps feel only at the instant those scissors slash their jugulars. As in Get Out, that privilege breeds dissociation, one of the ripest subjects for a genre that brings to roaring life the revenge of the repressed. But to give Peele’s vision its due, you’d need the skills of an artist-animator like Hayao Miyazaki, for whom the boundary between the physical and spiritual worlds is porous and those rabbits could take human form — and vice versa. As a horror buff, I hate to admit it, but Peele’s attachment to creaky genre tropes is already starting to hold him back. The good news is that he’s more than halfway to creating his own syntax, his own means for illuminating the sunken places of the world. I have a feeling there will be miraculous excavations to come.